In this tutorial, we will build on top of the Get Started with VTA tutorial and introduce additional concepts required to implement matrix multiplication on VTA with the TVM workflow. We start by programming the Pynq’s FPGA and building its RPC runtime as we did in the VTA introductory tutorial. # to match the VTA configuration specified by the vta_config.json file. # Program the FPGA with a pre-compiled VTA bitstream. # by passing the path to the bitstream file instead of None. # In simulation mode, host the RPC server locally. In this example we describe a simple matrix multiplication addition, which requires multiple computation stages, as shown in the dataflow diagram below. First we describe the input tensors A and B that are living in main memory. Second, we need to declare intermediate tensors A_buf and B_buf, which will live in VTA’s on-chip buffers. Having this extra computational stage allows us to explicitly stage cached reads and writes. Third, we describe the matrix multiplication computation over A_buf and B_buf to produce the product matrix C_buf. The last operation is a cast and copy back to DRAM, into results tensor C.
We describe the placeholder tensors A, and B in a tiled data format to match the data layout requirements imposed by the VTA tensor core. One source of complexity when targeting accelerators is to make sure that the data layout matches the layout imposed by the accelerator design. 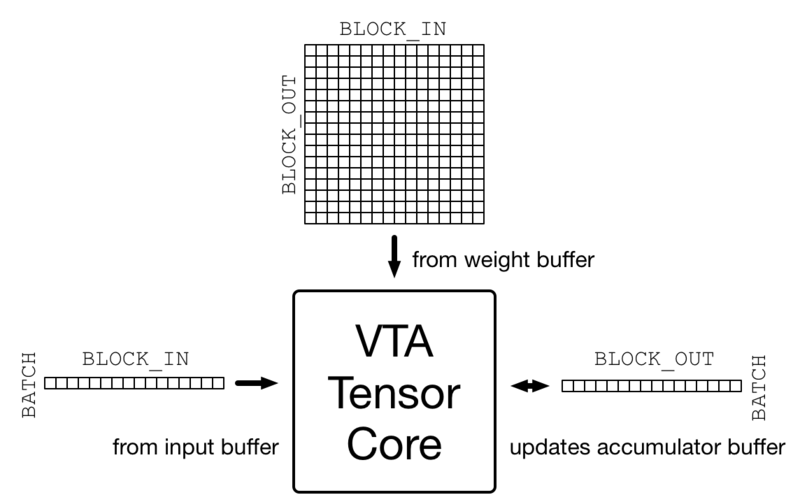 VTA is designed around a tensor core that performs, one matrix-matrix operation per cycle between an activation matrix and a weight matrix, adding the result matrix to an accumulator matrix, as shown in the figure below. The dimensions of that matrix-matrix multiplication are specified in the vta_config.json configuration file. The activation matrix has a (BATCH, BLOCK_IN) shape and the transposed weight matrix has a (BLOCK_OUT, BLOCK_IN) shape, thus inferring that the resulting output matrix has a (BATCH, BLOCK_OUT) shape. Consequently input and output tensors processed by VTA need to be tiled according to these aforementioned dimension. The diagram below shows the impact of data tiling on a matrix that is originally of shape (4, 8). Tiling by a (2, 2) tile shape ensures that data within each tile is contiguous. The resulting tiled tensor has a shape of (2, 4, 2, 2). We first define the variables m, n, o to represent the shape of the matrix multiplication. These variables are multiplicative factors over the BLOCK_OUT, BLOCK_IN, and BATCH tensor dimensions respectively. By default, the configuration file sets BATCH, BLOCK_IN, and BLOCK_OUT to be 1, 16 and 16 respectively (BATCH being set to 1 implies that our compute building block is vector-matrix multiply). It’s important to not only match the inner-tile dimension of VTA’s tensor core, but also to match the specific data types expected by VTA. VTA for now only supports fixed point data types, which integer width is specified in the vta_config.json file by INP_WIDTH and WGT_WIDTH for the activations and weights data types respectively. In addition, the accumulator data type integer width is specified by ACC_WIDTH. By default, the configuration file sets INP_WIDTH and WGT_WIDTH to 8. The accumulator width ACC_WIDTH is set to 32, in order to avoid overflow during accumulation. As a result, env.inp_dtype and env.wgt_dtype are all narrow 8-bit integers, while env.acc_dtype is a standard 32-bit integer. Now we’re ready to describe the matrix multiplication result tensor C, with another compute operation. The compute function takes the shape of the tensor, as well as a lambda function that describes the computation rule for each position of the tensor. In order to implement matrix multiplication, the lambda function needs to include a reduction formula over the input channel dimension axes. To create a reduction formula, we can declare a reduction axis using tvm.reduce_axis, which takes in the range of reductions. tvm.sum takes in the expression to be reduced as well as the reduction axes to compute the sum of value over all k in the declared ranges. Note that the reduction needs to be performed over 32-bit env.acc_dtype accumulator data types. No computation happens during this phase, as we are only declaring how the computation should be done. After the computation is done, we’ll need to send the results computed by VTA back to main memory. One specificity of VTA is that it only supports DRAM stores in the narrow env.inp_dtype data type format. This lets us reduce the data footprint for memory transfers, but also lets us quantize the wide accumulator data type down to a data format that matches the input activation data type. This means that in the context of neural network inference, the outputs of a given layer after activation can be consumed directly by the next layer. We perform one last typecast operation to the narrow input activation data format. This concludes the computation declaration part of this tutorial. While the above lines describes the computation rule, we can obtain C in many ways. TVM asks the user to provide an implementation of the computation called schedule. A schedule is a set of transformations to an original computation that transforms the implementation of the computation without affecting correctness. This simple VTA programming tutorial aims to demonstrate basic schedule transformations that will map the original schedule down to VTA hardware primitives. // attr [A_buf] storage_scope = "global"
// attr [B_buf] storage_scope = "global"
// attr [C_buf] storage_scope = "global"
DMA copy operations which will take globally-scoped tensors and copy those into locally-scoped tensors. Tensor operations that will perform the matrix multiplication. First, we set the scope of the buffers to tell TVM that these buffers will be living in the VTA’s on-chip SRAM caches. Below, we tell TVM that A_buf, B_buf, C_buf will respectively live in VTA’s on-chip input, weight and accumulator memory. VTA has three different memory scopes, each corresponding to different on-chip SRAM buffers. env.inp_scope: Input buffer, which is a read-only SRAM buffer that stores input matrices of shape (env.BATCH, env.BLOCK_IN) of type env.inp_dtype. The input buffer contains 2 ^ LOG_INP_BUFF_SIZE matrix elements (as specified in the vta_config.json file). env.wgt_scope: Weight buffer, which is a read-only SRAM buffer that stores weight matrices of shape (env.BLOCK_OUT, env.BLOCK_IN) of type env.wgt_dtype. The weight buffer contains 2 ^ LOG_WGT_BUFF_SIZE matrix elements. env.acc_scope: Accumulator buffer, which is a read/write SRAM buffer that stores accumulator matrices of shape (env.BATCH, env.BLOCK_OUT) of type env.acc_dtype. The accumulator buffer is VTA’s general purpose register file: it holds both intermediate results of convolutions and matrix multiplications as well as intermediate results of pooling, batch normalization, and activation layers. The accumulator buffer contains 2 ^ LOG_ACC_BUFF_SIZE matrix elements. We need to schedule DMA transfers to move data living in DRAM to and from the VTA on-chip buffers. This can be achieved using the compute_at schedule primitive which nests the copying of the buffers into the computation loop that performs the matrix multiplication. We insert dma_copy pragmas to indicate to the compiler that the copy operations will be performed in bulk via DMA, which is common in hardware accelerators. Finally, we print the temporary schedule to observe the effects of moving the copy operations into the matrix multiplication loop. // attr [C_buf] storage_scope = "local.acc_buffer"
// attr [A_buf] storage_scope = "local.inp_buffer"
// attr [B_buf] storage_scope = "local.wgt_buffer"
The last step of the schedule transformation consists in applying tensorization to our schedule. Tensorization is analogous to vectorization, but extends the concept to a higher-dimensional unit of computation. Consequently, tensorization imposes data layout constraints as discussed earlier when declaring the data layout input placeholders. We’ve already arranged our tensors in a tiled format, so the next thing we need to perform is loop reordering to accommodate for tensorization. Here we choose to move the outermost reduction axis all the way out. This dictates that we first iterate over input channels, then batch dimensions, and finally output channels. Lastly, we apply the tensorization scheduling primitive tensorize along the outer axis of the inner-most matrix matrix multiplication tensor block. We print the finalized schedule that is ready for code-generation by the VTA runtime JIT compiler. // attr [iter_var(vta, , vta)] coproc_uop_scope = "VTAPushGEMMOp"
This concludes the scheduling portion of this tutorial. After we have finished specifying the schedule, we can compile it into a TVM function. # Write the compiled module into an object file. The compiled TVM function uses a concise C API and can be invoked from code language. TVM provides an array API in python to aid quick testing and prototyping. The array API is based on DLPack standard. We first create a remote context (for remote execution on the Pynq). Then tvm.nd.array formats the data accordingly. f() runs the actual computation. asnumpy() copies the result array back in a format that can be interpreted. Programming the FPGA with the VTA bitstream over RPC. Describing matrix multiplication via a series of computations. Describing how we want to perform the computation using schedule primitives. Compiling the function to the VTA target. Running the compiled module and verifying it against a numpy implementation.